Over the past decade, Darrah has turned to experts around the world for mentorship to help her attain her success and design an intentional life. Stumbling blocks happened along the way, and, as she overcame them, she became focused on sharing with others how they could avoid the same pitfalls. 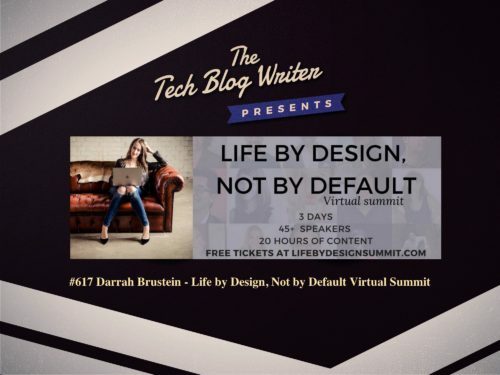 To give back to others who want to design their lives too, Darrah has brought together 45+ of her mentors and peers into a 3-day virtual summit that’s starting Wednesday, September 12th at 10 AM EST. On today’s podcast, Darrah reveals more about the event and the inspiration behind it. We also discuss the speaker lineup that includes people like Deepak Chopra, Kat Cole, Adam Grant, Jen Sincero, Ronny Turiaf! and even your favorite podcast host along with my good friends Sarah Elkins, Curt Mercadante and Heather R. Younger. All the speakers have one thing in common which is sharing Darrah’s way of giving back and teaching all of us how we can live a life by design, not by default. If you are thinking of launching your own podcast, sign up for my free session at the Life by Design, Not by Default – Virtual Summit and support your podcast host too.